WHAT AN INCREDIBLE NIGHT! Thank you to everyone who attended! We will forever be grateful to have experienced that with all of you! An event like this requires honesty and vulnerability to share your experiences and I think we achieved our goal of making sure it was a safe space for you to do just that. We’d also like to extend a HUGE thank you to our speakers for sharing their time and energy — we couldn’t have done it without you! To view a copy of Mic and Tara’s presentation, click here (trust us, you’ll want to remind yourself of that analogy! LOL). And as promised, Mic and Tara have provided all the details to their followup workshops — see below. Melissa was joined by Lorena Scott, Head of People at Ritual, Lisa Stam, Employment Lawyer + Founder of SpringLaw, and Kiran Rana, Digital Editor at The Globe and Mail (in that order for a very specific reason! LOL). 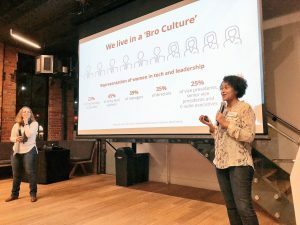 They provided great advice on questions to ask during an interview to gauge culture, how to document WTF moments properly, and the language to use when speaking to journalists before you’re sure you want to go public. As promised, Mic and Tara will also be offering follow-up workshops that dive deeper into the topic and will provide attendees with an opportunity to join a small group of us for a more hands on version of the talk. The first workshop will be Know Your Values, Know Your Boundaries and is scheduled for Wednesday, January 17, 2018. See below for more details on the event and click here to secure your seat. We will be capping the attendance at 20 people so that everyone gets the attention they deserve — we’ll add more dates if the demand is high. In this workshop Mic and Tara will work with each of you to uncover and define your core values. Similar to the “What fruit/vegetable/plant are you?” exercise that we touched on in the Girl Geeks presentation, we want you to get in touch with the most important parts of who you are. Secure your seat today! Click here to be redirected to Eventbrite. 0:05 | Q1 – Can you talk about imposter syndrome? 1:23 | Q2 – How can I overcome “slow drip” character assassination? 3:38 | Q3 – How do we educate men? 5:14 | Q4 – What about the subtle moments? What are the tools? 7:43 | Q5 – How can we break down cultural barriers? 9:44 | Q6 – How do you deal with career inadequacies? 11:22 | Q7 – What is leverage? 12:56 | Q8 – What can I do to make sure my employer hires equitably? 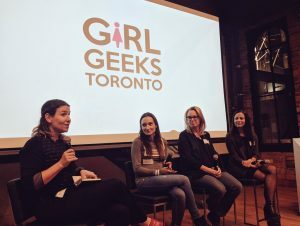 Girl Geeks Toronto is a nonprofit network run by a committee of volunteer organizers. Sponsorship inquiries? Email Anna Starasts directly. For all other inquires please complete the below.